In the Benedictus (Luke 1: 68-79), Zachariah sings about John: "As for you, little child, you shall be called a prophet of God, the Most High. You shall go ahead of the Lord to prepare his ways before him, to make known to his people their salvation through forgiveness of all their sins, the loving-kindness of the heart of our God who visits us like the dawn from on high." In 1981, on the Feast of the Birthday of St John the Baptist (just 42 days after the assasination attempt on John Paul II on the Feast of Our Lady of Fatima), it is reported Our Lady first appeared to 6 children in Medjugorje. "Mother Teresa of Calcutta always said that it was interesting that it is an unborn child who announces Jesus' presence in the womb of Our Lady. The unborn child is the first to recognise Christ and I believe that for our times this is a strong message to respect the life of unborn children. .. She also said the biggest power in the world is the power of tenderness, and although John was such an outspoken, strong person, he was still the herald and the messenger of the one who brought us God's tenderness.. 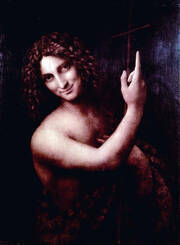 I believe this is the message of St John: the tenderness of God with the clarity and the strength of the truth." "My favourite story in the Bible is John the Baptist because, from the words, he sounds a very energetic, wild man who preaches the good news." "John the Baptist is also a child in the womb. We're told by his mother Elizabeth that he leapt with joy. John, in the womb, could receive Jesus, could receive the grace of Jesus's presence. A reminder to us that not only is a child in the womb a living human being, but a child in the womb has the capacity to receive God's grace, has a spiritual life, is in relationship with God." Even though in his hometown of Nazareth Jesus is not accepted as the Messiah, nonetheless, at the beginning of his public activity, his messianic mission in the Holy Spirit is revealed to the people by John the Baptist. The latter, the son of Zechariah and Elizabeth, foretells at the Jordan the coming of the Messiah and administers the baptism of repentance. He says: "I baptize you with water; he who is mightier than I is coming, the thong of whose sandals I am not worthy to untie; he will baptize you with the Holy Spirit and with fire. "65 John the Baptist foretells the Messiah-Christ not only as the one who "is coming" in the Holy Spirit but also as the one who "brings" the Holy Spirit, as Jesus will reveal more clearly in the Upper Room. Here John faithfully echoes the words of Isaiah, words which in the ancient Prophet concerned the future, while in John's teaching on the banks of the Jordan they are the immediate introduction to the new messianic reality. John is not only a prophet but also a messenger: he is the precursor of Christ. What he foretells is accomplished before the eyes of all. 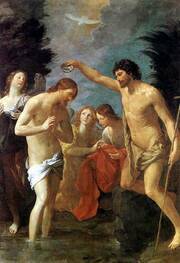 Jesus of Nazareth too comes to the Jordan to receive the baptism of repentance. At the sight of him arriving, John proclaims: "Behold, the Lamb of God, who takes away the sin of the world." He says this through the inspiration of the Holy Spirit, bearing witness to the fulfillment of the prophecy of Isaiah. At the same time he confesses his faith in the redeeming mission of Jesus of Nazareth. On the lips of John the Baptist, "Lamb of God" is an expression of truth about the Redeemer no less significant than the one used by Isaiah: "Servant of the Lord." Thus, by the testimony of John at the Jordan, Jesus of Nazareth, rejected by his own fellow-citizens, is exalted before the eyes of Israel as the Messiah, that is to say the "One Anointed" with the Holy Spirit. And this testimony is corroborated by another testimony of a higher order, mentioned by the three Synoptics. For when all the people were baptized and as Jesus, having received baptism, was praying, "the heaven was opened, and the Holy Spirit descended upon him in bodily form, as a dove"68 and at the same time "a voice from heaven said 'This is my beloved Son, with whom I am well pleased.'" At the dawn of the New Testament, John the Baptist, unable to refrain from speaking of the law of the Lord and rejecting any compromise with evil, "gave his life in witness to truth and justice",142 and thus also became the forerunner of the Messiah in the way he died (cf. Mk 6:17-29). "The one who came to bear witness to the light and who deserved to be called by that same light, which is Christ, a burning and shining lamp, was cast into the darkness of prison... 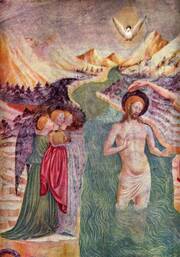 The one to whom it was granted to baptize the Redeemer of the world was thus baptized in his own blood". The Church calls all people to this conversion, following the example of John the Baptist, who prepared the way for Christ by "preaching a baptism of repentance for the forgiveness of sins" (Mk 1:4), as well as the example of Christ himself, who "after John was arrested,...came into Galilee preaching the Gospel of God and saying: 'The time is fulfilled, and the kingdom of God is at hand; repent and believe in the Gospel'" (Mk 1:14-15). Today, 24 June, we are celebrating the Solemnity of St John the Baptist. He is the only saint — with the exception of the Virgin Mary — whose birth the liturgy celebrates and it does so because it is closely connected with the mystery of the Incarnation of the Son of God. In fact, from the time when he was in his mother’s womb John was the precursor of Jesus: the Angel announced to Mary his miraculous conception as a sign that “nothing is impossible to God” (Lk 1:37), six months before the great miracle that brings us salvation, God’s union with man brought about by the Holy Spirit. The four Gospels place great emphasis on the figure of John the Baptist, the prophet who concludes the Old Testament and inaugurates the New, by identifying Jesus of Nazareth as the Messiah, the Anointed One of the Lord. In fact, Jesus himself was to speak of John in these terms: “This is he of whom it is written ‘Behold I send my messenger before your face, who shall prepare your way before you. Truly I say to you, among those born of women there has risen no one greater than John the Baptist; yet he who is least in the kingdom of heaven is greater than he!” (Mt 11:10-11). John’s father, Zechariah — Elizabeth’s husband and a relative of Mary — was a priest of Old Testament worship, he did not immediately believe in the announcement of such an unexpected fatherhood. This is why he was left mute until the day of the circumcision of the child to whom he and his wife gave the name God had indicated to them, that is, John, which means “graced by God”. Inspired by the Holy Spirit, Zechariah spoke thus of his son’s mission: “And you, child, will be called the prophet of the Most High; for you will go before the Lord to prepare his ways, to give knowledge of salvation to his people in the forgiveness of their sins” (Lk 1:76-77). All this came to pass 30 years later when John began baptizing people in the River Jordan, calling them to prepare themselves with this act of penance for the imminent coming of the Messiah, which God had revealed to them during their wanderings in the desert of Judaea. This is why he was called the “Baptist”, the “Baptizer” (cf Mt 3:1-6). When one day Jesus himself came from Nazareth to be baptized, John at first refused but then consented; he saw the Holy Spirit settle on Jesus and heard the voice of the heavenly Father proclaiming him his Son (cf Mt 3:13-17). However, the Baptist’s mission was not yet complete. Shortly afterwards he was also asked to precede Jesus in a violent death: John was beheaded in King Herod’s prison and thus bore a full witness to the Lamb of God who had recognized him and publicly pointed him out beforehand. Dear friends, the Virgin Mary helped her elderly kinswoman Elizabeth when she was expecting John to bring her pregnancy to completion. May she help all people to follow Jesus, the Christ, the Son of God, whom the Baptist proclaimed with deep humility and prophetic fervour." in Italia ricorre oggi la Giornata per la carità del Papa. Ringrazio tutte le comunità parrocchiali, le famiglie e i singoli fedeli per il loro sostegno costante e generoso, che va a vantaggio di tanti fratelli in difficoltà. A questo proposito, ricordo che dopodomani, a Dio piacendo, farò una breve visita nelle zone colpite dal recente terremoto nel Nord Italia. Vorrei che fosse segno della solidarietà di tutta la Chiesa, e perciò invito tutti ad accompagnarmi con la preghiera. En ce jour de la fête de la nativité de saint Jean-Baptiste, je suis heureux d’accueillir les pèlerins francophones présents pour la prière de l’Angélus. 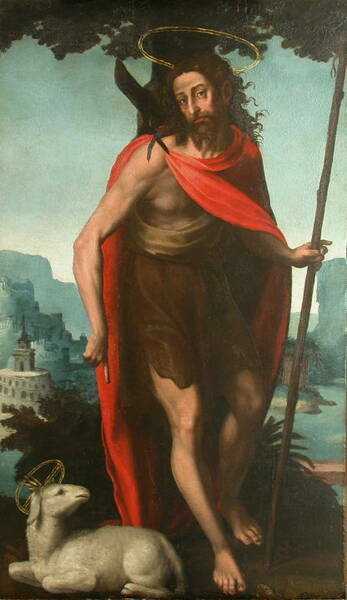 Saint Jean-Baptiste, le plus grand des enfants des hommes, a su reconnaître le Seigneur. Après avoir baptisé Jésus dans les eaux du Jourdain et l’avoir désigné comme le Messie, il s’est effacé humblement devant lui. Son exemple nous invite à nous convertir, à témoigner du Christ et à l’annoncer à temps et à contre temps, en étant comme lui la voix qui crie dans le désert, et cela jusqu’au don de notre vie. Avec la Vierge Marie sachons rendre grâce à Dieu pour tous ses bienfaits! Bon dimanche! I greet all the English-speaking pilgrims and visitors present for today’s Angelus. This Sunday, we celebrate the birth of John the Baptist, the great saint who prepared the way for our Lord. 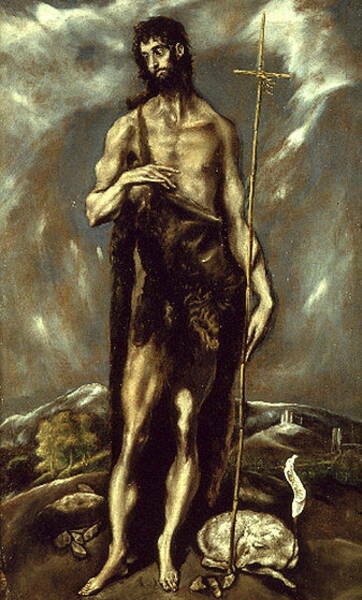 John was a voice, crying in the wilderness, calling God’s people to repentance. Let us heed his voice today, and make room for the Lord in our hearts. May God bless all of you. Zum Hochfest der Geburt des heiligen Johannes des Täufers, das am heutigen Sonntag gefeiert wird, grüße ich alle deutschsprachigen Pilger und Besucher ganz herzlich, besonders die Schülerinnen und Schüler aus Landstuhl. Johannes der Täufer ist der Wegbereiter des Herrn. Sein Name bedeutet: „Gott ist gnädig.“ Seine Geburt ist für die Verwandten und Nachbarn Grund zur Freude und ein Anlaß, Gott zu preisen. Bitten wir diesen Vorläufer Jesu um seine Fürsprache, daß auch wir mitwirken können, den Herrn anzukündigen, ihm den Weg zu bereiten und sein Erbarmen sichtbar zu machen. Der Herr segne und behüte euch alle. Saludo con afecto a los peregrinos de lengua española que participan en esta oración mariana, en particular a los miembros de la comunidad boliviana en Italia, aquí presentes. La Iglesia celebra hoy la Natividad de San Juan Bautista, precursor del Señor, que en el seno materno exulta de gozo al llegar el Salvador del género humano. Quien fue la voz que dio a conocer a Cristo, Cordero que quita el pecado del mundo, nos sigue invitando hoy a escuchar y a acoger la divina Palabra, de la que él mismo dio testimonio, incluso con el derramamiento de su sangre. Confiemos estos propósitos a la Santísima Virgen María, a la que hoy deseo invocar bajo los gloriosos títulos de Copacabana y Urkupiña. Feliz domingo. Pozdrawiam Polaków. Jednoczę się duchowo z arcybiskupem poznańskim, ojcami filipinami i wszystkimi pielgrzymami, którzy w Sanktuarium Matki Bożej w Gostyniu obchodzą 500-lecie jego istnienia. Dziękujemy Bogu za łaski, jakimi w tym miejscu darzył kolejne pokolenia przez przyczynę Maryi. Jej opieka niech stale Wam towarzyszy! Niech Bóg wam błogosławi! Rivolgo un cordiale saluto ai pellegrini di lingua italiana, in particolare ai numerosi volontari delle Pro Loco d’Italia. Cari amici, mi rallegro con voi per i 50 anni della vostra Associazione ed auguro ogni bene per suo servizio al patrimonio culturale del Paese. Saluto i giovani di Zaccanopoli, Diocesi di Vibo Valentia, e i ragazzi dell’Oratorio Salesiano di Andria. A tutti auguro una buona festa, una buona domenica, una buona settimana. Grazie!" Today, 24 June, the liturgy invites us to celebrate the Solemnity of the Birth of St John the Baptist, whose life was totally directed to Christ, as was that of Mary, Christ's Mother. John the Baptist was the forerunner, the "voice" sent to proclaim the Incarnate Word. Thus, commemorating his birth actually means celebrating Christ, the fulfilment of the promises of all the prophets, among whom the greatest was the Baptist, called to "prepare the way" for the Messiah (cf Mt 11: 9-10). All the Gospels introduce the narrative of Jesus' public life with the account of his baptism by John in the River Jordan. St Luke frames the Baptist's entrance on the scene in a solemn historical setting. My book Jesus of Nazareth also begins with the Baptism of Jesus in the Jordan, an event which had enormous echoes in his day. People flocked from Jerusalem and every part of Judea to listen to John the Baptist and have themselves baptized in the river by him, confessing their sins (cf Mk 1: 5). The baptizing prophet became so famous that many asked themselves whether he was the Messiah. The Evangelist, however, specifically denied this: "I am not the Christ" (Jn 1: 20). Nevertheless, he was the first "witness" of Jesus, having received instructions from Heaven: "He on whom you see the Spirit descend and remain, this is he who baptizes with the Holy Spirit" (Jn 1: 33). This happened precisely when Jesus, after receiving baptism, emerged from the water: John saw the Spirit descending upon him in the form of a dove. It was then that he "knew" the full reality of Jesus of Nazareth and began to make him "known to Israel" (Jn 1: 31), pointing him out as the Son of God and Redeemer of man: "Behold, the Lamb of God, who takes away the sin of the world!" (Jn 1: 29). As an authentic prophet, John bore witness to the truth without compromise. He denounced transgressions of God's commandments, even when it was the powerful who were responsible for them. Thus, when he accused Herod and Herodias of adultery, he paid with his life, sealing with martyrdom his service to Christ who is Truth in person. Let us invoke his intercession, together with that of Mary Most Holy, so that also in our day the Church will remain ever faithful to Christ and courageously witness to his truth and his love for all." "Questa domenica, che precede la solennità dei Santi Pietro e Paolo, è in Italia anche la Giornata per la carità del Papa. Cari fedeli italiani, vi sono vivamente grato per la preghiera e per il sostegno solidale con cui partecipate all'azione evangelizzatrice e caritativa del Successore di Pietro nel mondo intero. Aux pèlerins francophones réunis ce matin pour la prière de l’Angelus, j’adresse une cordiale bienvenue. Je les invite à être d’ardents témoins de l’Évangile, vivant au quotidien le service de leurs frères, et préparant, à la suite de saint Jean Baptiste, les chemins du Seigneur. Avec ma Bénédiction apostolique. I offer a warm welcome to all the English-speaking pilgrims and visitors gathered for this Angelus prayer. 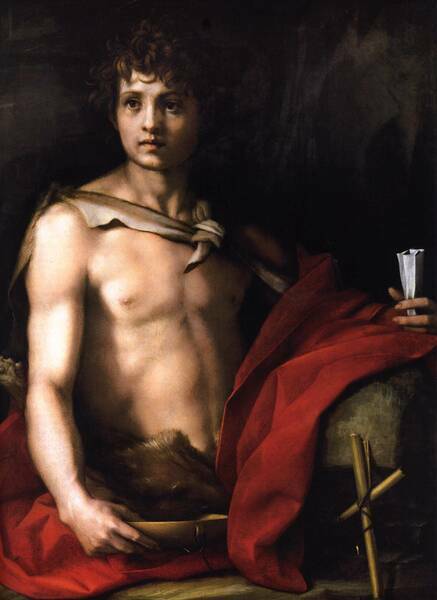 Today, as the Church celebrates the Birth of Saint John the Baptist, let us ask for the gift of true conversion and growth in holiness, so that our lives will prepare a way for the Lord and hasten the coming of his Kingdom. Upon all of you I invoke God’s blessings of joy and peace! Zum Hochfest der Geburt des heiligen Johannes des Täufers, das auf den heutigen Sonntag fällt, grüße ich ganz herzlich alle deutschsprachigen Pilger und Besucher, insbesondere die Chorgemeinschaft aus Kostritz. Die Gestalt des Johannes, des Vorläufers Christi, stellt gewissermaßen den Übergang vom Alten zum Neuen Testament dar: Johannes kündigte den Messias an und wurde selbst Zeuge für Christus, das Lamm Gottes. Bitten wir diesen großen Heiligen um seine Fürsprache, daß auch wir Christus erkennen und seinen Weisungen in unserem Leben stets folgen. - Gottes Geist geleite euch auf all euren Wegen! Saludo cordialmente a los peregrinos de lengua española. Os exhorto a vivir santamente, para que, siguiendo la voz de San Juan Bautista, el precursor, cuya festividad celebramos hoy, podáis llegar con alegría al Salvador, Nuestro Señor Jesucristo, el Hijo de María. ¡Feliz domingo! Serdecznie pozdrawiam wszystkich Polaków. Dziś wspominamy narodziny św. Jana Chrzciciela. Pan Jezus powiedział, że „między narodzonymi z niewiast nie powstał większy" od niego (por. Mt 11, 11). Jego wstawiennictwu polecam wszystkich, którzy za jego przykładem wprowadzają w świecie sprawiedliwość Królestwa Bożego. Niech Bóg wam błogosławi! Saluto infine i pellegrini di lingua italiana, in particolare i bambini di Alberoro, che hanno ricevuto la Prima Comunione, e il gruppo di famiglie di Casalmaggiore. A tutti auguro una buona domenica." Even while still in his mother's womb he celebrated the Lord's coming with joyful movements since he was unable to do so by word. Elizabeth said to blessed Mary: “When the voice of your greeting reached my ears, the child in my womb leaped for joy” (Lk 1,44). 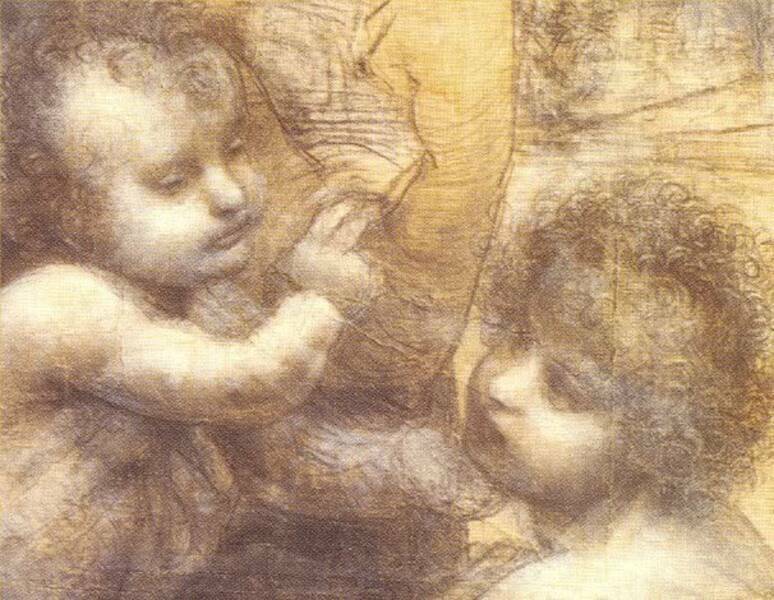 John, then, rejoiced before his birth, and even before his eyes could recognise what the world looks like, his spirit already recognised who is its lord. I think that this is the meaning of the prophet's words: “Before I formed you in the womb, I knew you; before you were born I had consecrated you” (Jer 1,5). So let us not be astonished if, locked up in the prison where Herod had put him, he went on preaching Christ through his disciples' mediation (Mt 11,2) since, shut up as he was in his mother's womb, he was already proclaiming the Lord's coming with his bounds. "The greatest of men was sent to bear witness to Him who was more than a man. For when he who is «from among those born of women the greatest" (Mt 11,11) said: "I am not the Christ" (Jn 1,20) and abased himself before Christ, he gave us to understand that in Christ there is something more than a man... "From his fullness we have all received" (Jn 1,16). What does it mean by "all of us"? It means the patriarchs, prophets and holy apostles, both those who came before the Incarnation and those who have been sent subsequently by the Incarnate Word himself: "of his fullness we have all received." We are clay pots; he is the spring. Thus.., John is man, Christ is God. Man must be abased that God may be exalted. It is to teach us to humble ourselves that John was born on the day after which the days begin to grow shorter; to show us that God must be exalted, Jesus Christ was born on the day when the days begin to grow longer. There is a profoundly mysterious teaching at stake here. We celebrate John's nativity as we do Christ's because this particular nativity is full of mystery. What mystery? The mystery of our greatness. Let us grow smaller in ourselves to grow greater in God. Let us humble ourselves in our lowliness to be exalted in his greatness. Yes indeed, John the Baptist sacrificed his life with all his heart here below for love of Christ. He chose to despise the commands of a tyrant rather than those of God. His example teaches us that nothing should be dearer to us than the will of God. Pleasing other people is of little value, indeed, it often causes great harm... Therefore let us die to our sins and anxieties with all God's friends, tread underfoot our misguided self-will and be careful to allow fervent love for Christ to grow within us."